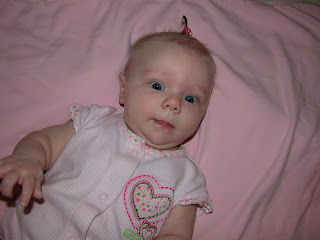 Blair Family Blog: Camrie's First Piggy Tale! 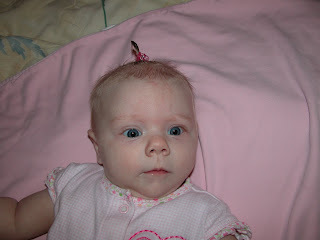 Camrie's hair is getting long enough to actually do things to it besides the classic curl down the middle of her head. She doesn't have to much but today I put it in an elastic and thought it turned out pretty cute. She cried while I did it, but I have always said, if you don't start when they are young they will never sit for you to do it when they are older. Carlie and Maci love getting there hair done. 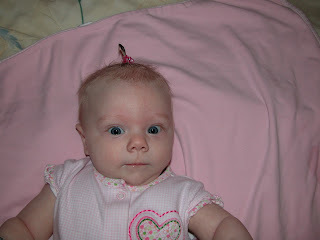 So here are some pictures of her 1st hair do! Pretty cute Camrie!!! So cute!!! My girls don't ever have enough hair until they are about 2 1/2 to pull up. I was BALD until I was 3, then it was just peach fuzz. We're gonna be late to church tomorrow and I have a sore throat, so you might not want me to have the baby. See you tomorrow!!! To cute! Hey you gotta give me a call so we can get plans rolling!